Putting up a curtain pole sounds like such a simple DIY job, but in period properties soft crumbly plaster and bricks can make getting a secure fixing difficult, and in modern new builds, uPVC frames can cause similar issues. Use out step-by-step guide to find out how to put up a curtain pole to ensure you get it right, first time. Shopping for window treatments? Before you buy, find out how to choose the best curtains for your windows and doors. Work out how long your curtain pole needs to be, taking into account that 20cm should be added to each side of the window so the drawn back curtain will not block out light during the day. Consider that the heavier the curtain material and the thicker the lining, the more room they will take up when pulled back. This should be factored into your final measurement. 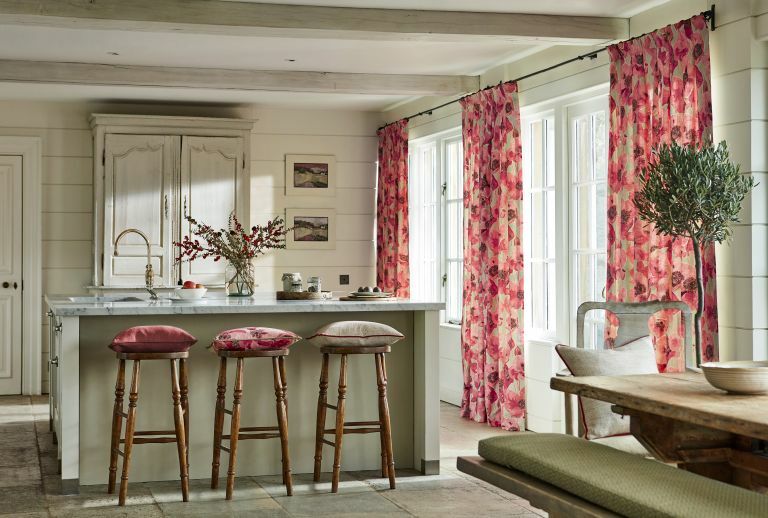 For step-by-step instructions, take a look at our guide to how to measure up for curtains. Now you need to mark up where to site the pole and decide on the distance above the window. Allow at least three inches above the top of the frame in order to make an attractive drop and to keep out cold air during winter. If you have the curtains already, hold them up in situ to see what height will work best. This stage is a two person job as the level needs to be done by eye rather than using a spirit level. Mark up the position of the brackets using a pencil. When nothing is square it is probably best to fix the pole parallel with the top of the window rather than following the line of the ceiling or the result could look wonky. Make a guide mark with a bradawl, then drill a pilot hole and drive the screw in. If fixing into masonry, insert a wall plug first. Always choose a drill bit to match the plug and a plug to match the screw size. Wrap a piece of tape round the drill bit to indicate the correct depth that the hole must be drilled to fit the screw. Newer buildings and those that have been refurbished may have a reinforced concrete lintel over the window. Making a hole in this is usually way beyond the capabilities of a cordless drill. Corded ones are often more powerful; use a new, good quality masonry drill bit and select the hammer action. If your drill still baulks at the concrete, borrow an SDS drill (Special Direct System), which has an even stronger hammer action. You may need to switch to a metal drill bit if you hit some steel reinforcing the lintel. Once you’ve made the holes, inserted the wall plugs and put up the brackets you’ll have peace of mind knowing that you have a really good fixing. Top tip: When dealing with soft bricks use a smaller diameter bit in case the hole ends up too big. Hold drill square to the wall. Start drilling slowly and build up the speed as the bit goes deeper. Before drilling make sure there are no electrical cables or water pipes in the wall that you may inadvertently pierce. Insert one screw through the first bracket. Just drive it three-quarters of the way home so you can swivel the bracket to one side to allow for drilling the second hole. Select a screwdriver to match the screw head. Too small and it may wring the head; too big and it can gouge the plaster. Now go to the other end of the curtain pole. Drill and plug one hole for the second bracket. Insert the screw three quarters of the way in. Before fixing the second screws, stand back and survey the window to make sure that you are satisfied with the position and level of the curtain pole. If you have a very wide window or heavy lined curtains you may need to support the pole with another bracket in the middle. Slide the rings on to the pole. At each end leave one ring to sit between the bracket and the end of pole to hold the curtains in place across the width of the window when you draw them. Want more expert DIY advice?